Game Night at the Exchange Club! « St. Patrick’s Day Celebration on March 16th at the Exchange Club (Bldg.617)! 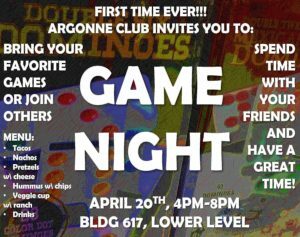 The Argonne Club will host a game night on Thursday, April 20, 2017, at the Exchange Club (Bldg. 617 Lower Level) from 4 to 8 p.m. Employees can bring their favorite board games or join in with others.